It continued to rain all night. 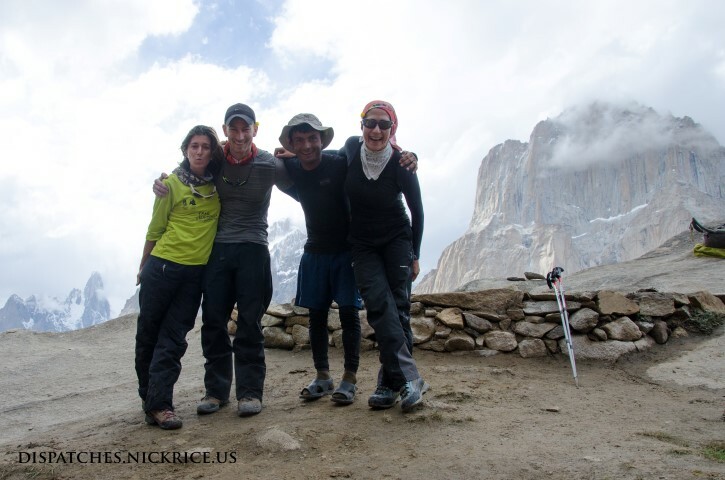 We awoke at 5:00am and were told that we needed to decide whether we would wait in Paiju one day for the weather to improve or continue on as planned to Urdukas. After consulting with Hadi Ali, our Sirdar from Shigar who informed us that the porters agreed to continue despite the weather, we elected for the latter and quickly prepared our loads. We walked for over 5 hours before we broke for lunch at Korbuche. The route was severely convoluted by a massive landslide which we had to cross and which created a huge lake that we needed to circumnavigate. After lunch (again in the rain, but this time with no shelter) we continued on for around 3 hours before arriving to Urdukas (3902m). Our porter loads took hours more to arrive and the temperature was frigid in camp. We finally settled in for dinner as the last of our loads arrived. Tomorrow we will continue on to Goro II and the following day we should arrive to Broad Peak base camp.